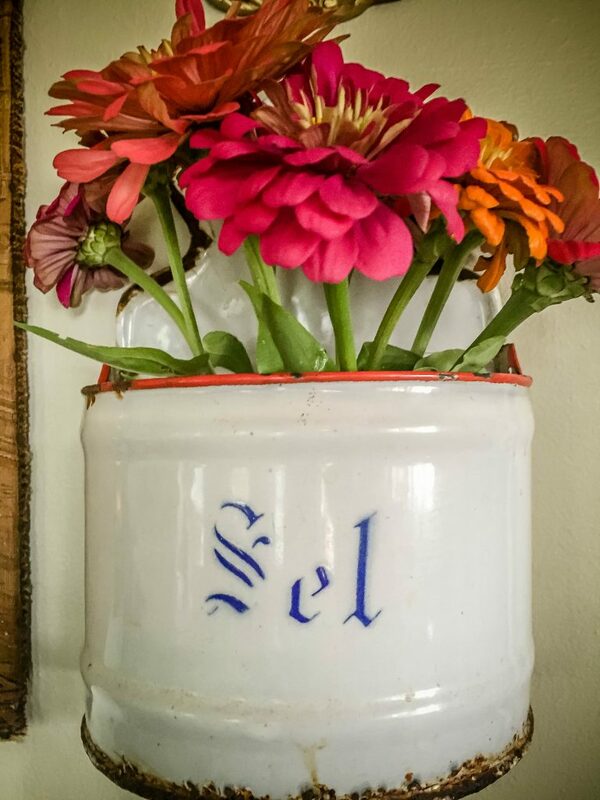 There’s no magazine-picture-perfect house with six kids, a hubby and a farm but you can have Perfect Farmhouse Flowers. Style it up as I may… stay on top of it as I might, there’s always an overripe sock (on a kitchen counter) today’s stack of junk mail (right where I’m trying to blog) or a fort being built out of furniture and blankets by a herd of little ones (in the living room). And that’s OK. That’s my life and I love it. But I do like things pretty. Really pretty, in fact. And my secret weapon? 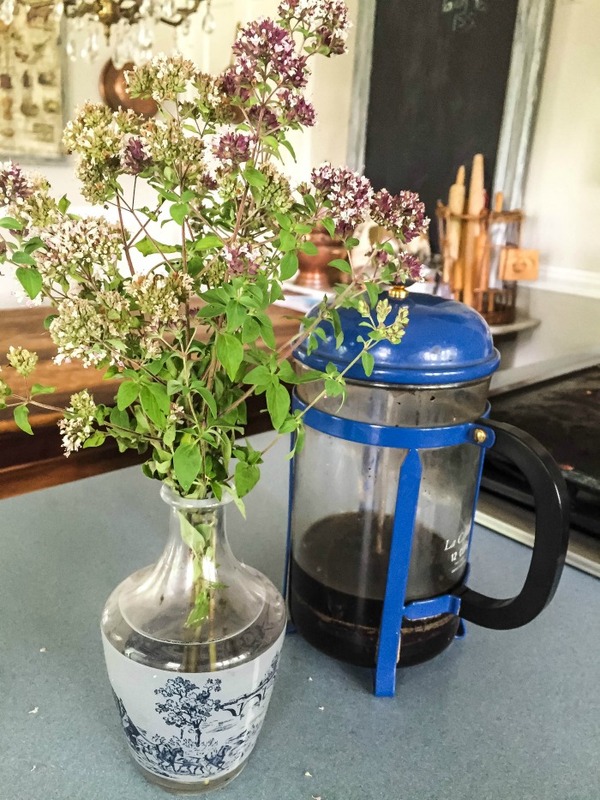 Fresh Farmhouse flowers on the table. #1 He is allowed to buy me the unassembled bouquets from the grocery store or Costco so I can design them myself. But no flowers from the florist. That’s no fun for me. #2 NEVER red roses. Gag. Giving flowers is a love language for me. I love to show up with a bouquet… even if it’s just a handful of rosemary tied with a ribbon. It’s a thing. It makes me feel good. And I hope it makes the receiver feel really good. Even though I think annuals are an expensive pain in the rear I do love to have them around. 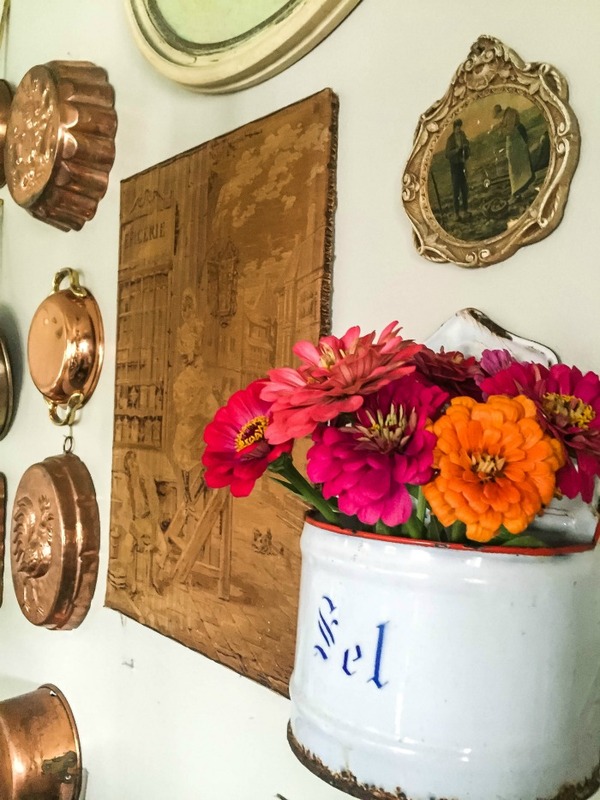 Fresh cut flowers brighten any room! 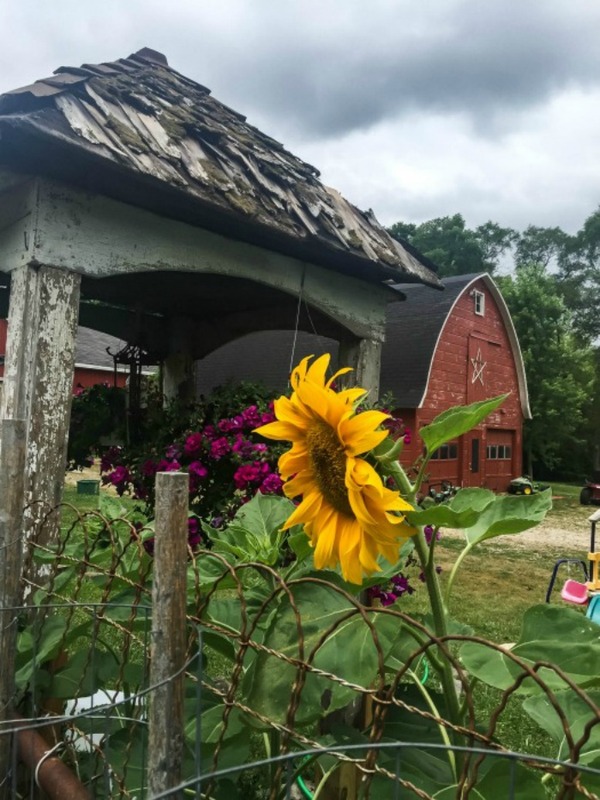 My favourite annuals are snapdragons and zinnias but we grow sunflowers, calendula, nasturtiums and more here on Half-Way Farm…la Ferme a Mi-Chemin. Cram ’em in. That’s right. Pop two plants in one hole now and again while you’re planting. This bulks up the look of your garden. Miracle Grow the snot out of ’em. Miracle Grow is just about the ONLY chemical we use around here. 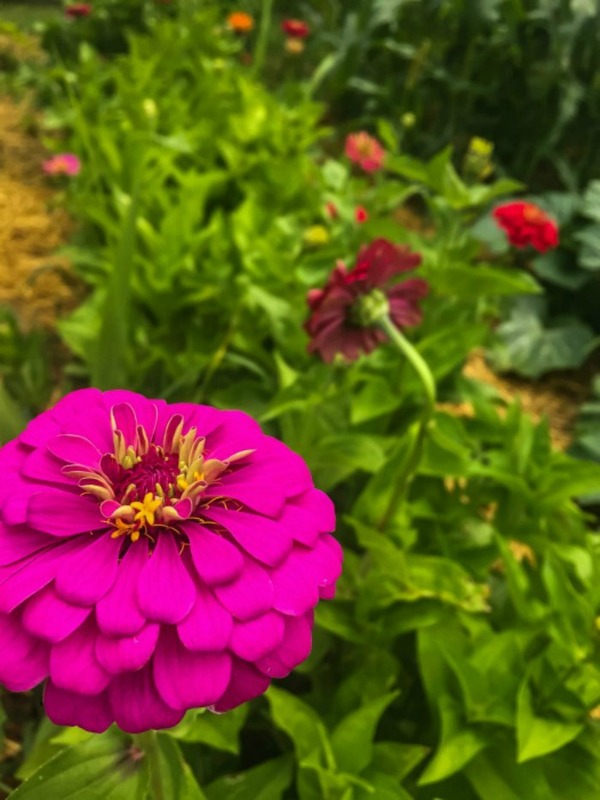 I know, I know… you can make your own, I just haven’t gone “green” yet when it comes to massive blooms in the garden, I recommend every ten days to two weeks on your annuals. Trim ’em back. Cut those bouquets girl. The more you cut, the more they grow. And be sure to “deadhead” any old, crispy growth too. This is especially important for flowers like petunias and geraniums. But what about actually making the bouquet? …You can do it! Get some sharp scissors or a knife and get out there! You can have so many choices…. all of one kind of flower, a small variety (3 or 4) or a huge assortment for a more wildflower look. If you decide on one type of flower, I love it when they are all mashed together and cut low in a small vase or container. Don’t forget to use fabulous containers! Get creative! 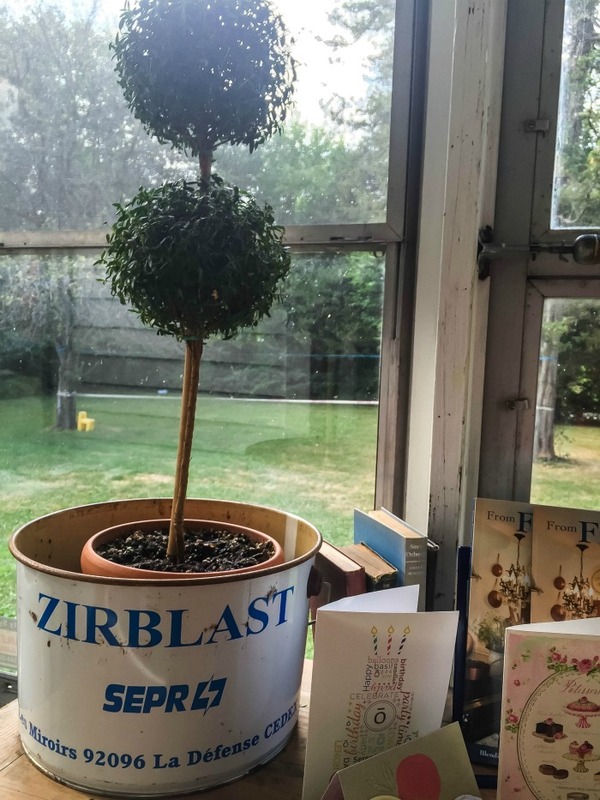 I know it’s not a floral… but I’m so lovinv’ this old bucket that I received as baby gift in! Merci Jamie! 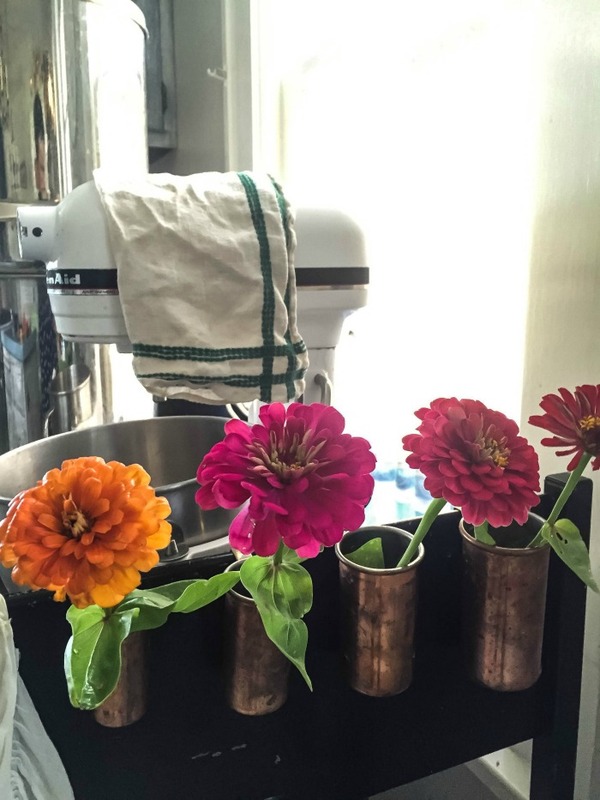 …And these copper measuring cups from Momma for my birthday! Hanging over the edge of my library cart/baking station. ADORE! See that little “Made in England” stamp? I’m a SUCKER for stuff stamped Made in France or Made in England! Keeping that bouquet looking fabulous is easy to do! I’ve got four tricks for that! Once your flowers are cut for a bouquet, be sure to trim off any leaves that you don’t want and remove the leaves that will be under the water line. 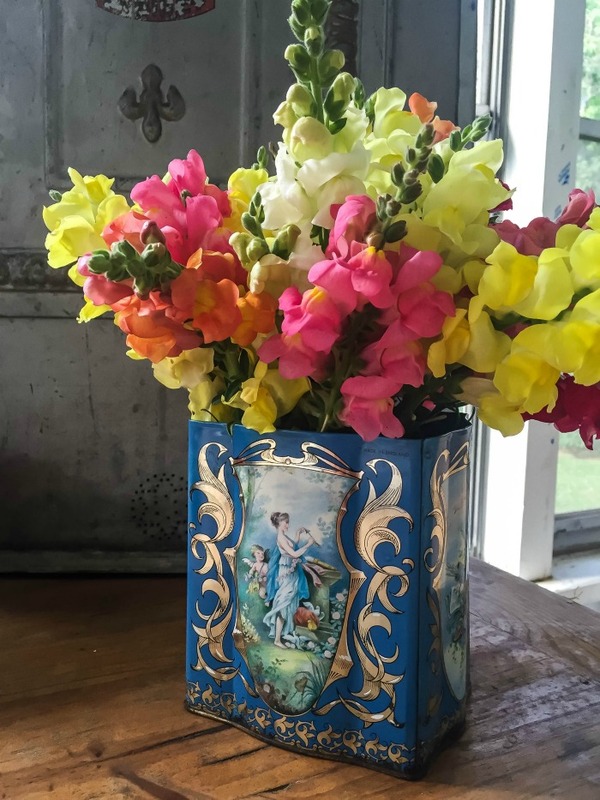 Use cool water in your vase and change it every day. Keep your bouquets out of direct sunlight. And… to keep them nice and fresh store your arrangements in the fridge overnight! 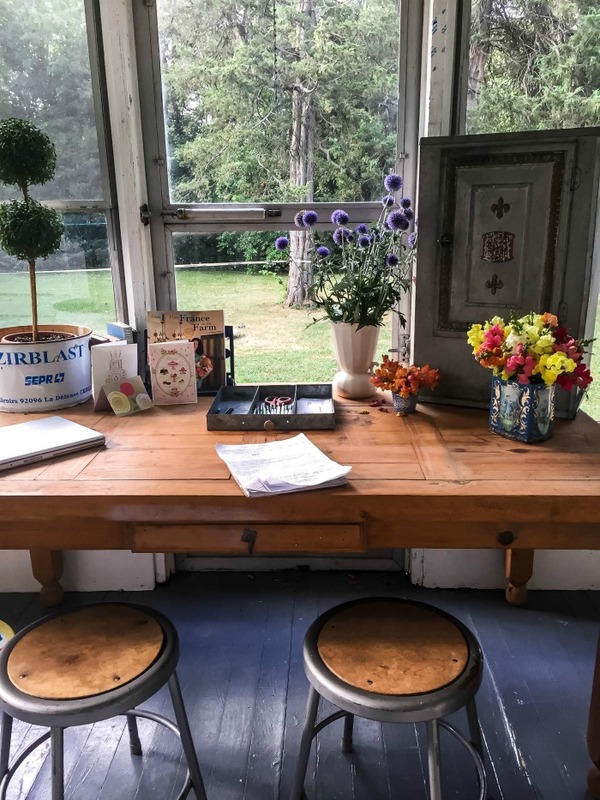 I hope your tabletops sport lovely flowers all summer long… and by all means… if you don’t have a garden, go treat yourself and buy yourself a bouquet to make your own Farmhouse Flowers. Love all these tips! 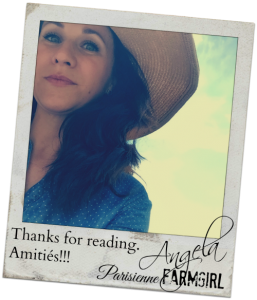 So so beautiful Angela! 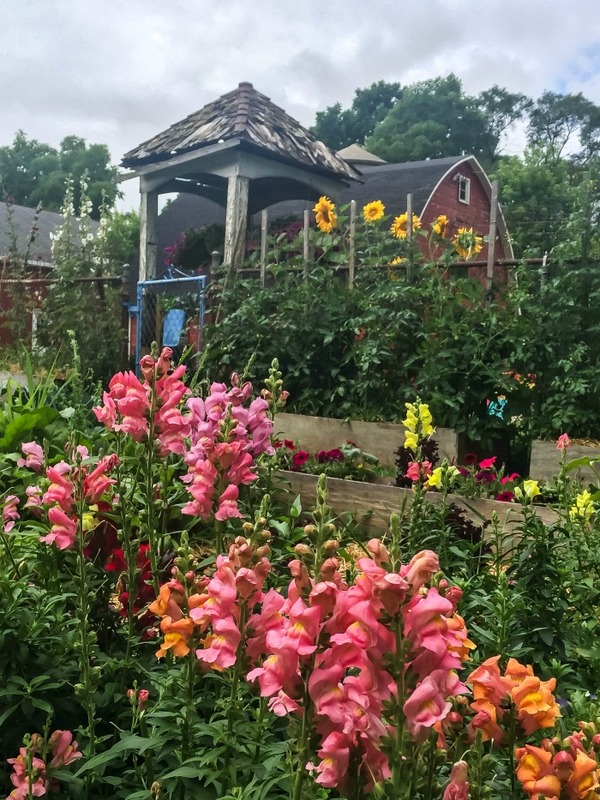 Your flowers , your farm and YOU! Rosemary! I love you lady!!!!! OKay, the flowers are lovely, yada,yada,yada…but seriously? That table for $25!!!!???? You make me jealous with your finds girl. Amazing score! yes, Yes, YES! Spirit lifting ~ fresh flowers rock. Love putting together this and that from the garden. Sometimes I blow even my own mind when a spontaneous gathering comes together so beautifully. OR When I take a moment and study a single bloom in a vase. Our creator has blessed us with astounding beauty if only we take time to “smell the roses.” Great inspiration, Angela. A always your energy and creativity and enthusiasm makes a visit to your blog a happy respite. I love your farm and fresh flowers. No red roses for me as well. I love flowers and plants in random containers. In fact, there’s a gin bottle at the grocery store I really want as a vase, and I don’t even drink gin! 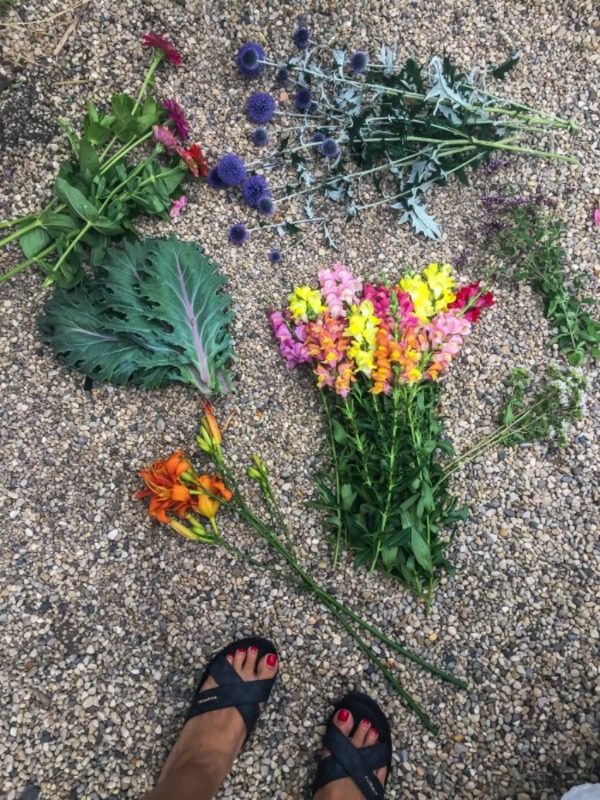 When my children (4 of them) were young and money was tight, I’d spend $10 a week on flowers from the grocery store – because it made me feel rich and brought me joy. I stopped doing it years ago (as those same kids started having their own families) – probably because I no longer go grocery shopping “all the Tim”. Thanks for reminding us how much joy simple, inexpensive or free bouquets can be!! 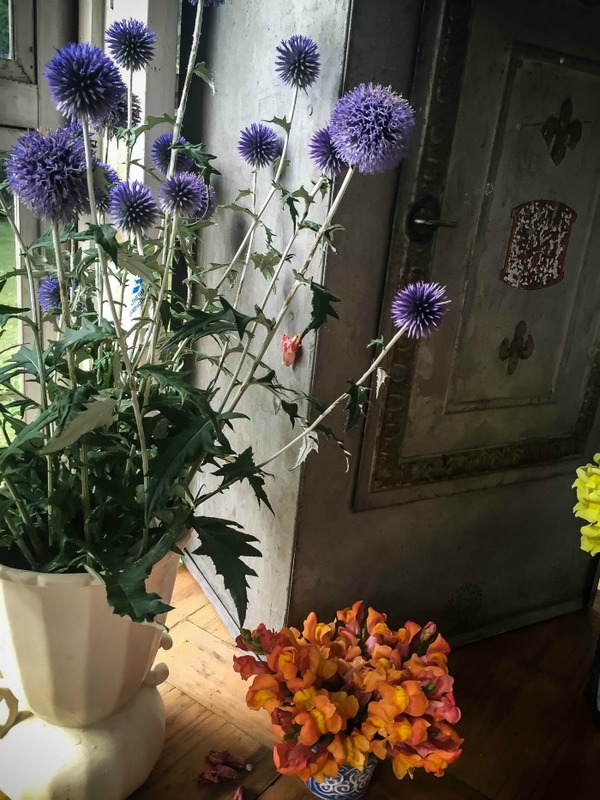 You inspired me to go out and cut my globe thistle. Sage always goes in my zinnias for the kitchen window. And the teddy bear sunflowers are just gorgeous this year. Wishing you and your new baby well. Oh my goodness… thank you. It’s hard for me cause I remember my “old garden” all the time (we rent here and owned there) so your words mean a lot to me! 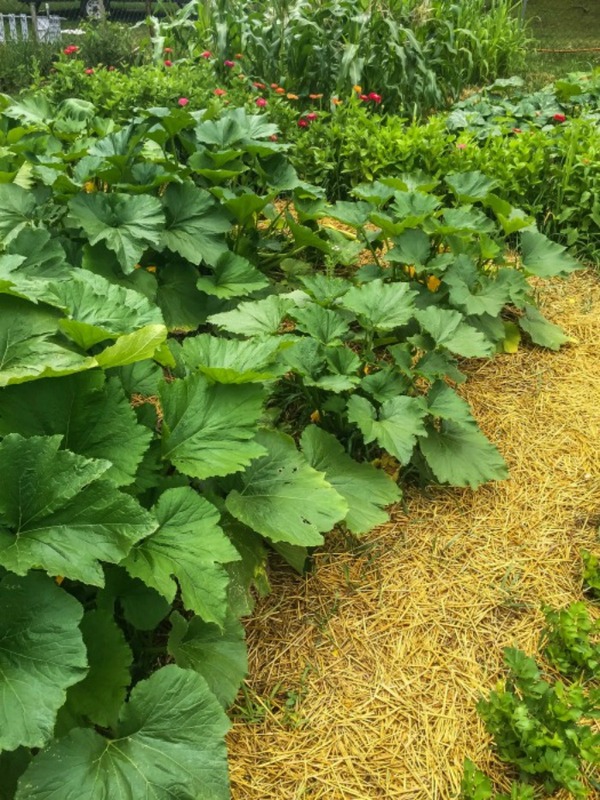 Can you show pics of your old garden? 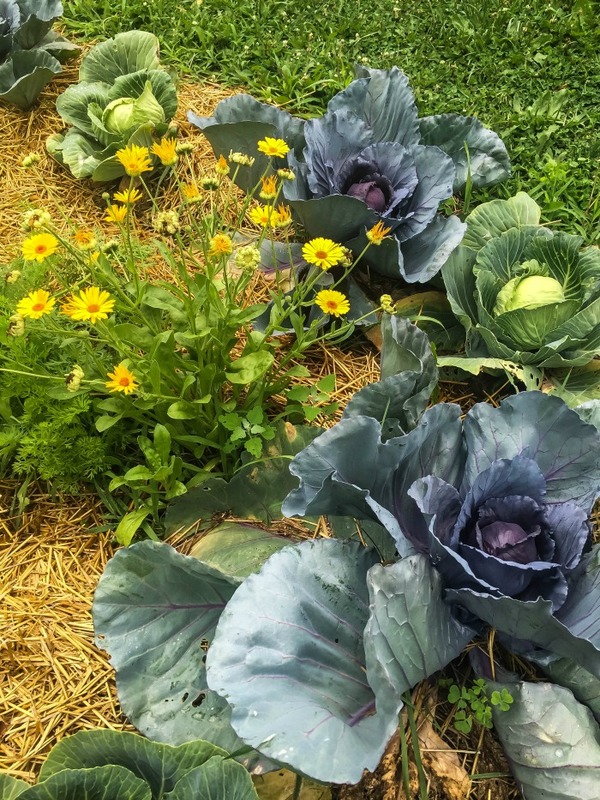 If you search Potager on this blog you’ll find lots. It’s over on the sidebar on the right. You can search anything you remember there. your flowers are lush and your art of home making for your little ones is lovely! any little gifts we give oursleves (like your flowers) are life softeners and we all need them. HAPPY BIRTHDAY TO A WONDERFUL PERSON I KNOW YOU ARE BLESSED! 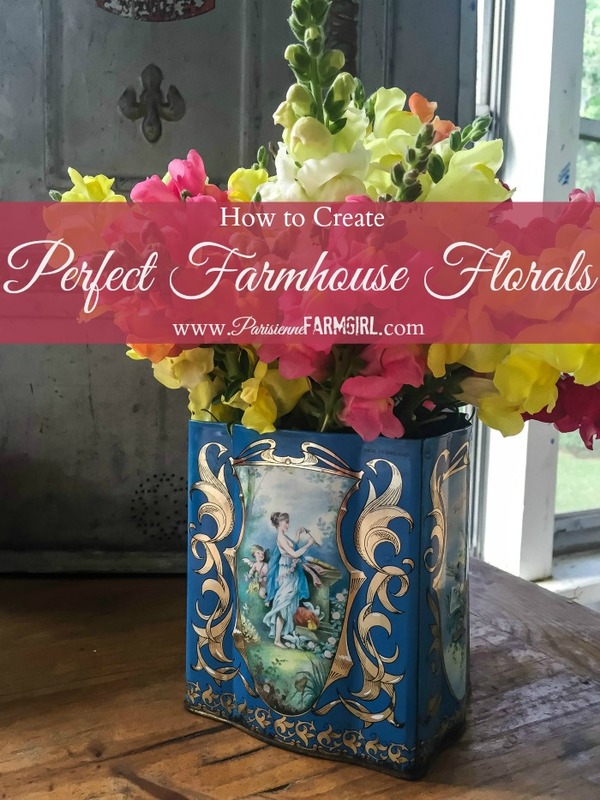 When I think of farmhouse flowers I think of what’s gathered from the land wildly growing. 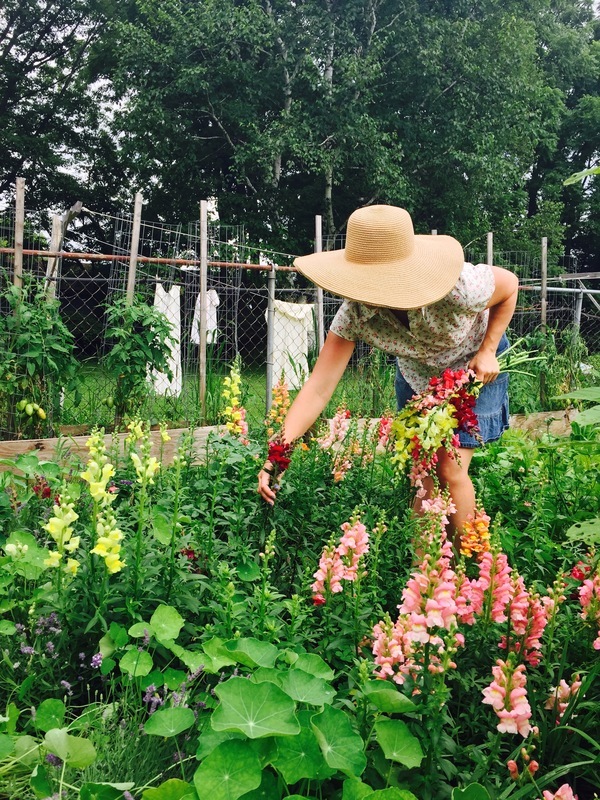 Your beauty here is as pure as organic gets… Beautiful photo of you picking flowers, love the clothes on the line in the background drying in the fresh farm air. Beautiful days like these filled with flowers everywhere.